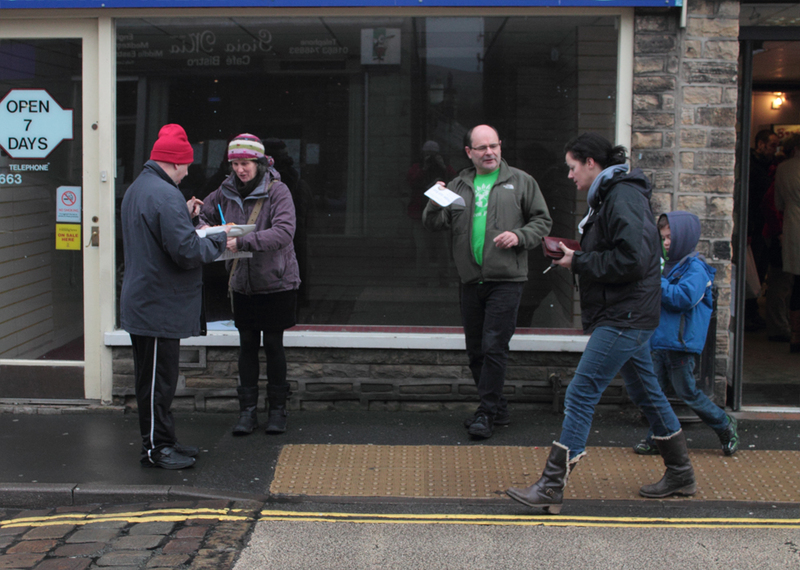 Derbyshire Green Party members from the High Peak area were out leafleting in Glossop, New Mills and Buxton on Saturday. Shoppers were given leaflets in support of Kat Boettge’s campaign to be elected to the European Parliament in May. With elections to the European Parliament being held under a fair voting system of proportional representation local Greens are hopeful that Kat will become the first ever Green MEP for the East Midlands Region. The financial sector is probably the richest economic sector in the world, it’s turnover is truly eye-watering, figures that we can hardly comprehend. This sector operates in our midst, consuming goods and services provided by society and the natural environment. It seems reasonable to me that the sector should make a fair payment to help to cover the cost of these services and to contribute to the proper functioning of society. This is the position of the European Union. Supported by public opinion across Europe, a majority of member states want the financial sector to make a fair and proportional contribution to public finances. This after all is what we are required to do as is any other sector of the economy. In addition a majority of ordinary tax payers think that the financial sector should be paying back what they have received form the European tax payer as the bail out finance needed to rescue them from their own failings. Let us keep reminding those who forget, like the Chancellor and Chief Secretary to the Treasury, that it wasn’t us, the ordinary tax payer who brought the global economy to its knees, it was the financial sector. But it was us who were called on to rescue them from their own folly. It is reasonable that they should acknowledge this and begin to pay us back the 4.6 trillion Euros they have had from us. After all that is that they expect when they give us a loan. • to discourage financial transactions which do not contribute to the efficiency of financial markets or of the real economy. That to me seems fair, who’s going to argue about it? Well the British Government for a start. Acting on behalf of their rich friends in the City, the Coalition Government promptly set about blocking the move. It seems that the richest among us do not like the idea of paying their way in the world. Frustrated by the action of the UK Government and the blocking actions of Tory MEP’s, the European Parliament on 12th December 2012 voted to allow those member stated that wanted to implement a harmonised transaction tax to go ahead. From 22nd January 2013, The Council of Europe gave its consent to 11 member states began the process of developing a common framework for a FTT. Immediately the British Government, responding to the tug on the strings from the City, launched a legal challenge. While this is ongoing, wasting yet more tax payers money, it has not blocked the development of the FTT. The countries that are developing the FTT lie at the heart of Europe and include the EU’s most successful economy, Germany. The other countries involved are Belgium, Estonia, Greece, Spain, France, Italy, Austria, Portugal, Slovenia and Slovakia. Most of the remaining countries are supportive to various degrees, most are watching developments and reserve the right to join at a later date. Only the British Government is working to block the tax. The new tax was supposed to have been finalised and implemented on 1 January 2014, but remains bogged down in detail but its supporters insist that it will happen. It is uncertain how much the tax will raise, current estimates are around 50 billion Euro’s per year, but it could be considerably more. There is also disagreement on where the money should go. Most will go to the national governments but the EU wants to be able to raise its own funds so as to reduce national contributions and the arguments and resentments that go with them. When the idea of a global currency transaction tax was discussed at the beginning of the millennium, it was intended that the money raised should be used to secure help for the emerging economies. Many in Europe want this ambition to remain in any allocation of funds. However the main motivation now is to rebuild Europe’s struggling economy, damaged by the apparent need to bail out the banks. There is wide spread support for getting the financial sector to help to rebuild the economy. A survey published by YouGov suggests that more than four out of five people in the UK think the financial sector has a responsibility to help repair the damage caused by the economic crisis. How this is done is more controversial since many who read the right wing press have a knee jerk aversion to the word Tax. However, surveys do indicate that a Robin Hood tax does have the support of two thirds of people in Britain, spread across the party divides. Perhaps the romantic appeal of Robin Hood and his merry men robbing the rich to give to the poor lives on in the hearts of the British people. For Greens, expecting wealthy people and corporations to make a fair contribution to the welfare of society is not robbery. Our aim is to build an economy that serves needs not greed, that helps to move our country to greater equality for the benefit of all. A financial transaction tax will help this process. We accept its complications and that it needs to be global, but we want Europe to take the lead to show that it is possible. Greens in the European Parliament will work together to promote the Robin Hood tax and ensure that it works for the common good. Categories: Economy, EU | Tags: acting together, economic justice, EU, Europe, Robin Hood | Permalink. On Sunday 19th Jan 12pm to 4pm : Frack Free Nottinghamshire are holding an interactive learning session on fracking, at the ICC, Mansfield Road, . Categories: Climate Change, Economy, Energy, Environment, Local Issues, News & Views | Tags: economic justice, environmental benefit, renewable energy | Permalink.